3 Summer Turf Diseases …and How to SOLVE THEM ALL! Each season comes with its own set of stresses and challenges for turf grass. While it’s true that in general, more heat and moisture will increase the growth rate of common turf grasses, too much of either of these elements can add significant stress to turf. Extreme conditions sometimes foster an environment that encourages turf pathogens to take hold. Now that summer is in full swing, let’s look at three common summer turf diseases Brown Patch, Pythium Blight and Summer Patch. Spotting these diseases in the early stages will help you mitigate damage from these diseases before it becomes all encompassing. Also known as “Rhizoctonia blight,” brown patch is caused by Rhizoctonia fungi. Brown patch becomes problematic during periods of high heat and humidity. It is most pervasive when low temperatures bottom out near 70F and day temperatures routinely exceed 85F. While warm season grasses are not immune, Brown Patch typically affects cool season grasses more severely. Rhizoctonia fungi pathogens begin by infecting the leaf blade. A brownish-purple band borders the lesions in the infected blade region. Sometimes turf can withstand blade infections, but should the fungus work its way into the crown (the actively growing region of the turf at ground level), most turf cannot survive. Brown patch starts as a small circle, then quickly expands in all directions, often leaving an affected patch more than 3 ft in diameter. A ‘smoke-ring’ with a blue or white appearance can often be seen on the leading edge of the patch as the fungal pathogen expands into healthy turf. ‘Cobweb-like’ structures can sometimes be seen when sunlight hits early morning dew in affected patches. These structures are the mycelium of the fungus; they are essentially filament-like extensions that help the fungus spread into new territory. The rate of brown patch infection is completely dependent on various environmental factors. Unfortunately, a large patch can develop from perfectly healthy turf in under 24 hours, making this one of the more aggressive turf pathogens. Fungicides may be applied, however once the problem is spotted, most of the damage has probably already been done. In the event of an infection, curtail the use of nitrogen fertilizers. If possible, ensure the affected soil has adequate drainage. Once the patch has stopped expanding, begin the remediation process by sparingly using slow-release fertilizer (less than .25lbs/1000sqft). To accelerate recovery, adjust your mower height to a slightly higher setting and allow the turf to fill back in. 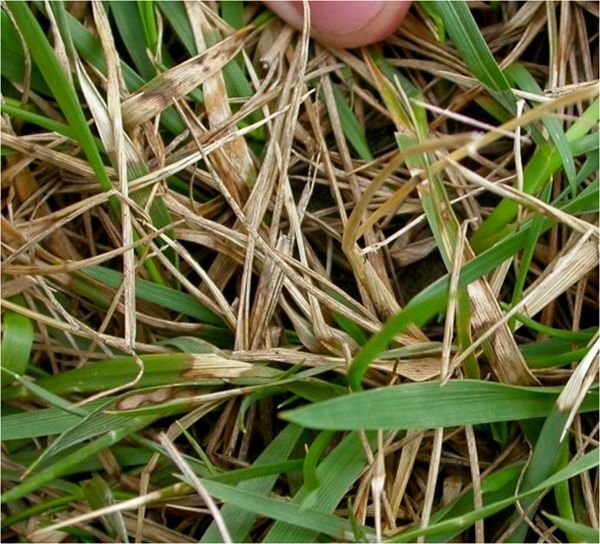 Also known as “grease spot” or “cottony blight,” Pythium blight can be problematic for a variety of ryegrasses and bentgrasses. Pythium blight is typically identified as a smattering of irregularly shaped spots ranging from .5 to 4 inches in diameter. Affected areas turn brown quickly. Similar to that of Brown patch, the mycelium of the Pythium fungus can sometimes be seen on dew-soaked turf in the early morning. Pythium is an extremely hardy fungus, often overwintering in spore form inside grass clipping and other biodegrading plant material in the thatch layer. When temperatures exceed 85F, Pythium is particularly destructive. Once identified, first cease the use of all fertilizers. The application of a fungicide is highly recommended the moment this fungus becomes problematic. On turf that has a history of Pythium blight, preventative fungicide applications are recommended. Ensure that the turf has adequate drainage. Once the disease appears to have halted its expansion, begin applying low doses of slow release fertilizer. Do not water lawns in the evening or at night. To prevent Pythium outbreaks in subsequent years, consider proper dethatching and aeration techniques in early fall and early spring (before rapid turf growth). Caused by the fungal pathogen Magnaporthe poae, summer patch (sometimes called ‘Poa patch’) primarily affects Kentucky bluegrass and other smaller fescues. It is particularly aggressive in high-maintenance lawns such as fairways. Summer patch is most commonly observed in areas of high foot traffic, poor drainage, and thatch build-up. The fungal pathogen begins by infecting root systems early in the spring, long before symptoms become visible. Eventually, stressed root systems under high soil temperatures (65F+) succumb to rapid pathogen expansion across the plant. Small circular patches appear in clusters overnight. Within a day or two, patches can expand to more than 12 inches in diameter. In the event of a summer patch outbreak, penetrant fungicides are recommended because they are better able to move into the root zone (the primary area of infection), however they are rather expensive, and only recommended in the event of a severe outbreak. The fungicide will be most effective when the pathogen is most active, therefore it is recommended that soil temperatures achieve a maximum of 65F+ for 3 consecutive days before application. There are many preventive measures that may be employed to reduce the chances of an outbreak. Core aeration/deep tine aeration in the fall and spring assist turf rooting by breaking up the thatch layer and increasing air exchange with the soil. Prolonged, but infrequent irrigation helps to prevent the kind of environmental conditions that encourage the Magnaporthe poae pathogen from establishing. Ensure that turf has an adequate supply nitrogen to reduce plant stress (always follow the recommended application rate of any fertilizer based on the climate and grass species). In the hot summer months, it is recommended that bluegrass and other smaller fescues receive no more than 0.1-0.2 lbs N per 1000sqft. Cutting the turf height to 2.5-3 inches will also reduce turf stress, making it less susceptible to fungal pathogens. Once the pathogen has run its course, new bluegrass blades may begin to fill in from the center outward, however in the more severe cases, topdressing and reseeding may be necessary. Turf diseases caused by fungal pathogens are very difficult to prevent outright because they spread very quickly. Good lawn maintenance practices in conjunction with knowing what symptoms to look for can mean the difference between having to remediate a few small affected patches of turf ORhaving a full-blown fungal outbreak across your yard. Keep your lawn green and health this summer; when the weather turns hot and humid, stay vigilant!